WheelHouse V4.109 is a new Fleet Administrative function that allows fleet admins the ability to restrict access to the Underway App on a user by user basis. This ensures that only authorized users are permitted to use the off-line application which ensures that data is not conflicted during syncing. WheelHouse V4.108 allows users to edit document descriptions of maintenance history entries. WheelHouse V4.107 modified the ftp file structure to allow equipment ID’s that had previously been deleted to be recreated without causing file structure errors. WheelHouse Underway™, an off-line tablet application for Apple™, Android™, and Windows™ devices is now available. 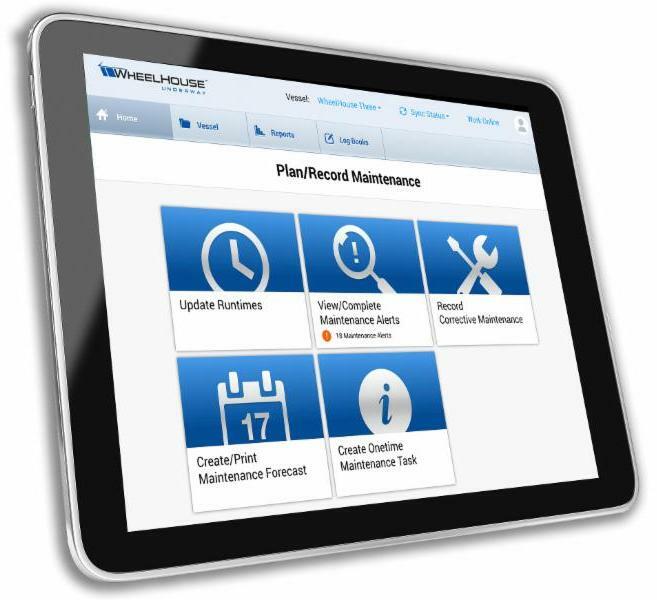 Underway expands the functionality of the WheelHouse Marine Maintenance System, which provides: fleet facilities & vessel specifications, documentation, maintenance recommendations, and spare parts guidelines in a cloud-based application. Underway provides the long-awaited off-line access to WheelHouse allowing customers a convenient way to view equipment information, documents, as well as enabling users to view and complete maintenance tasks when an internet connection is unavailable. Once an internet connection becomes available, all information may be synced to the cloud. WheelHouse Underway takes advantage of both tablet and cloud technology and provides a user friendly application even when internet is unavailable. With internet access limited in remote areas, engineers, yacht owners and crew, will find WheelHouse Underway an indispensable tool to keep their vessels’ maintenance current. Please review our underway-quick-start-guide for support in configuring Underway. 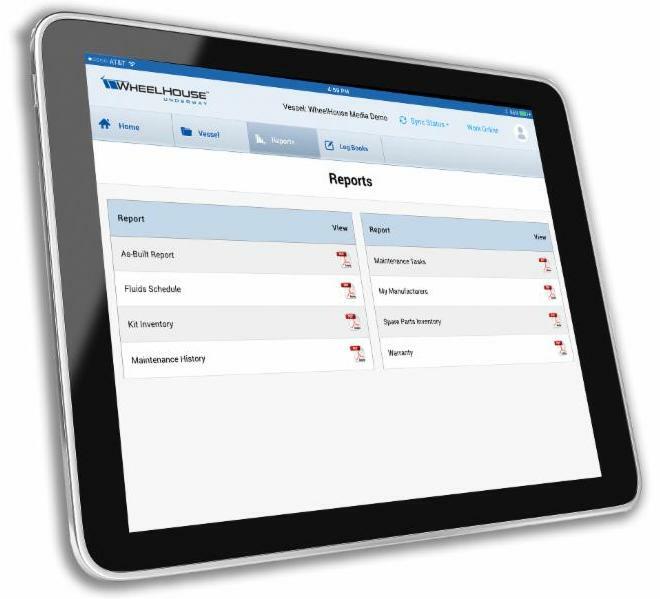 WheelHouse V4.106 provides fleet users the ability to print or export a Rescheduled Task Reports based off the filter settings established when creating the report. WheelHouse 4.1 was recently released which included the migration of code and user files to a more robust cloud server for improved performance and monitoring capabilities. In addition, provisions were included for WheelHouse Underway which included integration of an API and additional MySQL columns as required. We are near complete with he rolling release of Version 4.0 which is designed to aid Fleet Solutions customers with inventory, work management, and reporting requirements. Below is an outline of the key elements to this release as well as information on the additional elements yet to be released. We are also in the process of updating our knowledge base to reflect these additions. Work Order Modifications – Changes have been made to increase the dynamic nature of work orders. Issued work orders may now be edited and additional tasks may be added to an open work order. Inventory Parts – Depot parts may now be added to both OM’s and PM’s. Parts added to OM’s will be automatically subtracted from inventory when added to a task and they will be subtracted when a job is complete from PM’s. Fleet / Vessel Performance – Key Performance Indicators (KPI) such as mean time between failures, task completion compliance, and overall readiness are now available on the Fleet Reports tab. Maintenance cost reporting includes filtering on history type with calculator for labor rates. In addition there is now dismissed task and rescheduled task reason logging. Please note that this functionality will only work on history entries from this date forward. Fleet Notifications- Alert Settings have been added to the Settings tab to create instant notifications upon the creation or close of alerts and / or work orders. This also allows for the automatic notification to a user whom created an OM. Equipment Relocation – You are are now able to relocate equipment to another system. This is completed by clicking on the Admin tab within a vessel, selecting Equipment and changing the System name in the dropdown list. Fleet / Vessel Status- Under the Fleet Settings tab / Vessels, you now have the ability to add readiness status and vessel notes to the Fleet Vessel tab. Users- A users module, due to be released this week, allows fleet Admin users the ability to create unlimited users with various access levels. Five default configurations aid in the ability to set-up new users. Log Book- The log book has typically been a system log but the addition of a Fuel Log, Vessel Log, and separation of the existing logs, makes it a full function logging tool which will be released soon. Form Generator-We are in the process of developing a Form Generator which should be released later this month to allow users the ability to create their own electronic checklists and forms to be used in conjunction with the existing History Manager. This will aid in drill and inspection checklists as well as SMS, Subchapter M, and other reporting requirements. Access WheelHouse Mobile anytime at http://mobile.wheelhousetech.com and log-on using your normal user name and password. We recommend saving the link on your phone as well. WheelHouse Mobile is available on any smartphone, including Android-based phones, iPhones, and Blackberrys, among others. Receive Maintenance Alerts via email message whenever a new maintenance alert comes due, and link to WheelHouse Mobile directly from the message. You will only receive messages when a new Maintenance Alert comes due. Turn WheelHouse Mobile on/off from the WheelHouse (web) Admin menu, as well as identify up to 3 email addresses to receive Maintenance Alerts. Your email address of record is the default address. Update runtimes (to ensure your maintenance schedule is current), view new maintenance alerts as they come due, and view all active maintenance alerts at any time. After one day, all “New Alerts” can then be found in the “All Alerts” list. Maintenance Alerts that are completed in WheelHouse Mobile dynamically update your WheelHouse web application. WheelHouse Mobile includes Help topics, or you can always contact us at Support@wheelhousetech.com. WheelHouse Technologies has released version 1.0 of WheelHouse Mobile. WheelHouse Mobile is another step in our pursuit to deliver easy to use content that helps you maintain your vessel. Feel free to send us feedback on your experience, and don’t hesitate to contact us if you have any questions. 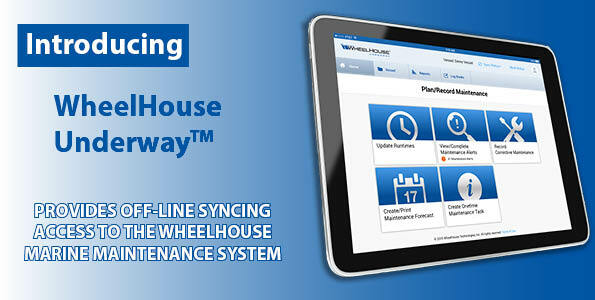 We encourage you to try WheelHouse Mobile and configure it according to your needs. Thanks for using WheelHouse and WheelHouse Mobile! V3.2 provides expanded support for the Streamlined Inspection Program for passenger vessels and adds new functionality for managing maintenance intervals for yachts and workboats. Fleets: Full support for the USCG Streamliined Inspection Program (SIP) is now available for passenger vessel fleets, including Inspection Criteria References, planning/scheduling/performing inspections, and support for Correction Reports. All Vessels: Ability to search and report on maintenance history using a date range. All Vessels: Users can now identify a maintenance frequency as “Fixed Recurring” so they alert on the same day each period regardless of when they were actually completed. For example, if a PMs Frequency is set to Quarterly and the Next Due is set to 3/1, then when the task is completed it will automatically reschedule to 6/1 regardless of when the task was actually completed. This is useful for cases like periodic inspections or spring commissioning when you want a task to alert at a specific time each period regardless of when it was last done. If “Fixed Recurring” is left unchecked (the default), the maintenance interval will schedule from the date the work is actually completed as it has always done. All Vessels: Some pages/reports that are data heavy (or whose pages take a while to build because of the amount of HTML that needs to be displayed) now have a “loading” animation that comes up until the page fully loads. This is so the user is aware that the application is working on delivering the content.